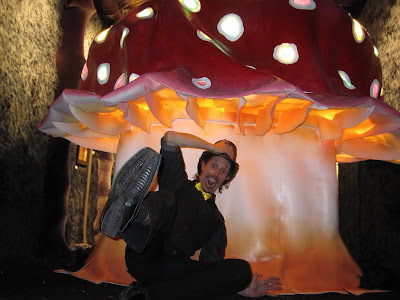 I had so much fun at the Alice in Wonderland themed show at the hive over the weekend. 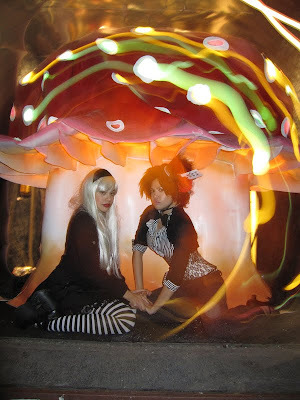 I got get decked out in an Alice themed costume, and I chose the mad hatter as a last minute decision because I'd been dieing to rock this wig for ages. 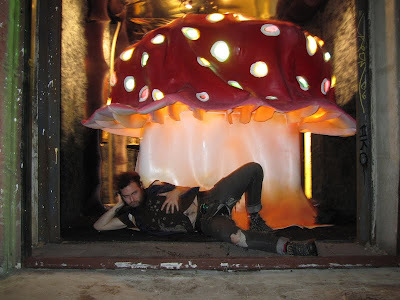 So I check out our gallery space to see the dope as mushroom couch that Blaine and his friend had been working on. I was totally impressed. I had no idea how massive it was! 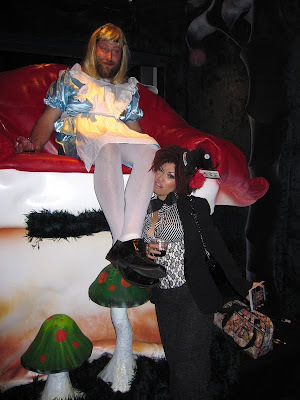 To top it off, there was a giant bearded Alice perched on it, taking photos with folks for a nickle a pop. Luckily I had a 25 1/2 cents. 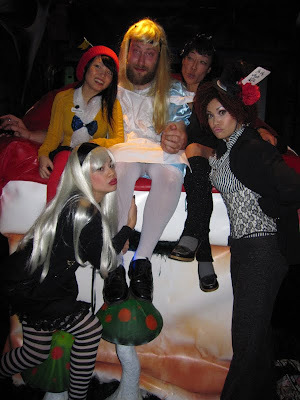 This Alice is really a giant. I think like 7ft or something crazy! ...A contortionist joined in on the fun. I meet contortionists everywhere I go. Lol. 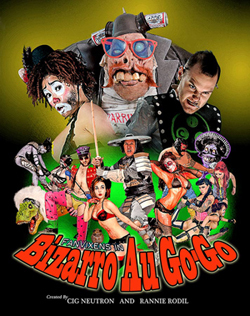 You can usually spot them wearing spandex all twisted up in an eye-catching spot. 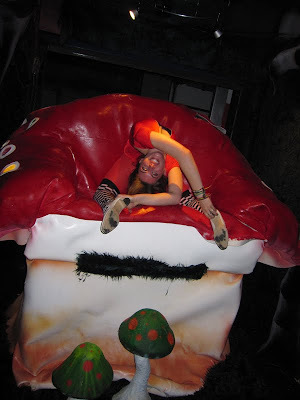 When the gallery ended, we had to shoot photos from the back of the awesome mushroom couch! Lol, give me a lil wine and I become a ham. ^Hark! Who goes there? I think it's safe to assume that I was pretty tipsy here. ^A bra we found out in the alley ? Forgot to switch back the settings on the camera. 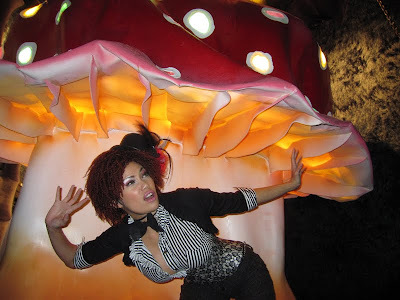 Me and sideshow bob. haha. ^an awesome piece I happened upon before we closed up the gallery. Oh yeah, just for good measure here's the makeup I did for my Liaisons of the Red Queen shoot. The makeup actually didn't take that long. It just took a while to do the brows because I covered them with brow wax and drew them in higher. I just caked on foundation 2 shades lighter than my face then dusted it with a generous amount of Makeup forever hd powder. Lips were painted on with a brush using occ liptar. Bloody mary red shadow and Urban decay shadow in Vapor. Urban decay eyeliner in yayo for lower water line then I drew fake lower lashes with Urban Decay black liquid eyeliner. Blush was Bare Minerals in Velvet. Red lashes from Hollywood Halloween shop. I'm excited for my party coming up this Friday the 12th. Hope everyone has a great week. Thanks for the concern in regards to the last post. I won't post the comments though because I don't need to add fuel to the unwanted fire. Smh. Love the pics. I swear-you go to the coolest events. Lol at the eat me cake. The Alice gallery looks awesome!! WOw! It's like your own little wonderland! 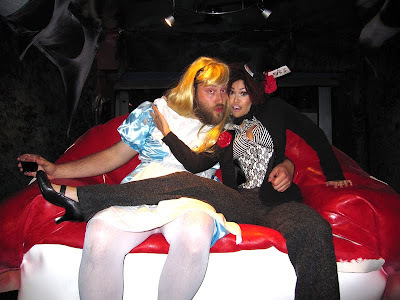 LOL at Bearded Alice! Haha!! If I could dress up as the Chesire Cat I would! Haha!! Hrmm.. Labia on display?! WOW! amazing makeup skills u got! i love that last photo. flawless makeup application, great you are!